…the benchmark hot hatch tested by David Miles (Miles Better News Agency). 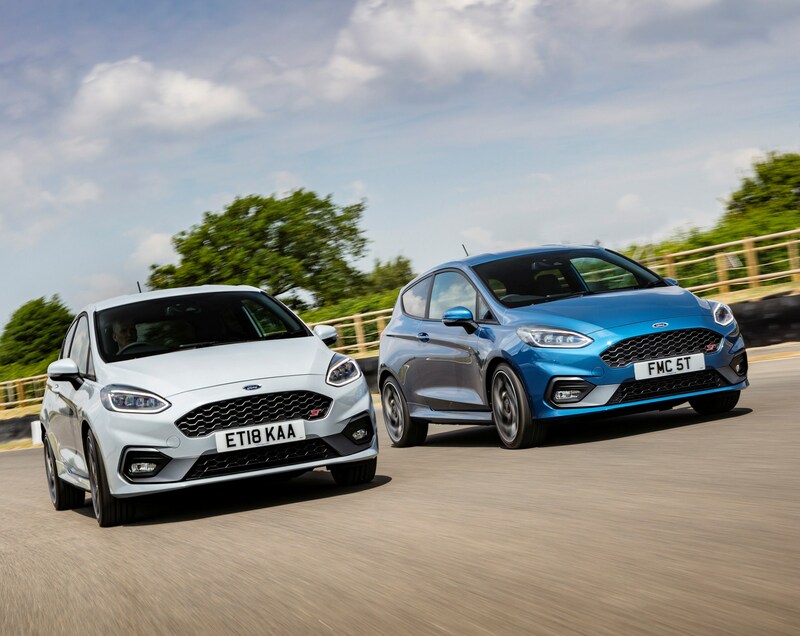 The Ford Fiesta range of three and five door hatchbacks, plus their recently introduced additional Active SUV inspired versions, are still the UK’s best-selling cars, not just supermini sized cars but cars overall. Flagship model for the extensive Fiesta range is the new high performance ST, available in three or five door forms, and this time around powered by a 1.5 litre, three cylinder turbocharged EcoBoost petrol engine pushing out 200 hp. This unit also has cylinder deactivation to improve fuel economy and lower emissions when driven under light load. It comes with a slick 6-speed manual gearbox. There is the option of a £850 Performance Pack which includes a Quaife limited slip differential to improve acceleration grip, and it also works alongside the torque vectoring system which brakes the inside wheel during high speed cornering. The pack also includes Launch Control and performance gear shift lights. There are three levels of specification to chose from; ST-1, ST-2 and ST-3, with prices starting from £19,245 and rising to £21,995 for three door versions. If you want a more user-friendly and convenient to use five door version then add £650 to those prices. In this very competitive new car world the Fiesta ST isn’t without rivals and the most obvious are the VW Polo GTi 2.0 litre 200 hp, the MINI Cooper S 2.0 litre 192 hp, Renault Clio RS 2.0 litre 200 hp, Toyota Yaris GRMN 1.8 litre 212 hp, Suzuki Swift Sport 1.4 litre 140 hp and just arriving is the Vauxhall Corsa GSi 1.4T 150 hp, which replaces the VXR variant. But the Fiesta ST has always been about performance figures so I’ll start with those first in this review. As a recap the last generation Fiesta ST was powered by a 1.6 litre four pot turbocharged 200 hp unit producing the same hp as the new three cylinder unit. Although the torque is also the same at 290 Nm (214 lb.ft) with the new 1.5 litre triple cylinder unit, it is delivered much earlier at 1,600 rpm, making it more responsive in the early stages of acceleration and a little quicker through the torque band, with a similar top speed. Top speed for the new Fiesta ST is 144 mph with zero to 62 mph taking 6.5 seconds. The new WLTP Combined Cycle fuel economy figure is 47.1 mpg and during my week long driving spell the real-life figure overall was 43 mpg, although speedier shorter runs reduced that to 40.1 mpg before it recovered during a long cruise back to 43 mpg overall. With CO2 emissions of 136 g/km the First Year VED rate is £205 and then £140 Standard rate. Company car users will pay 28% Benefit-in-Kind tax and insurance is Group 28. Warranty is Ford’s still ungenerous three years/60,000 miles. Continuing with figures my test drive Fiesta ST was the three-door version, which is expected to be the choice of 80% of UK customers, and with ST-3 specification, which will be the choice of about 70% of owners. The price is £21,995, but added to that cost were the most likely extra cost options of Performance Blue paintwork at £745, attractive full LED headlights at £600, Blind Spot Information system with Cross Traffic Alert at £350, the recommended Quaife limited slip differential pack at £850 and the B&O Play premium sound system at £350, giving a total on-the-road price of £24,890 which is still competitive given its performance. I’d pay the extra £650 to have the five door version which in real-life is more user-friendly and practical for carrying passengers. The three door version is a bit self-indulgent by the driver and shows little consideration for other potential family/friends passengers. The Fiesta ST-3 is well-equipped at all levels. 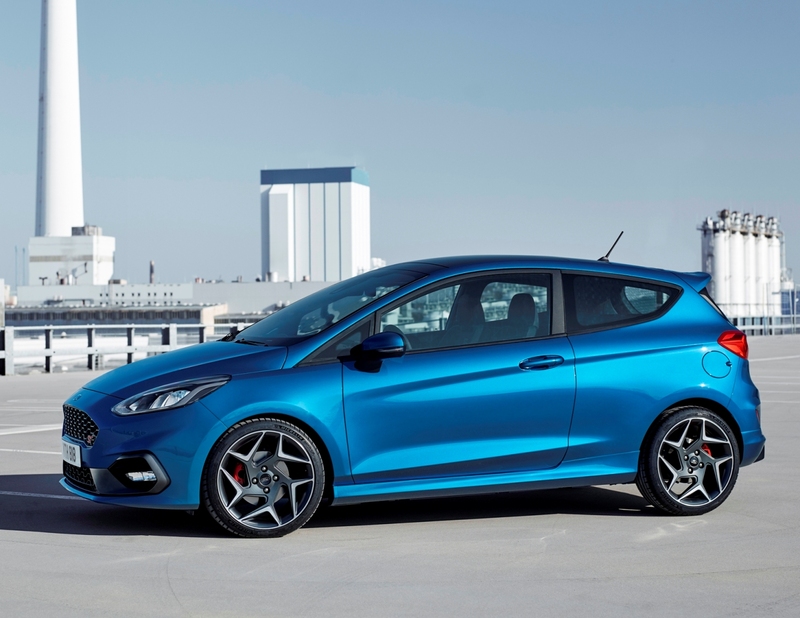 ST-1 trim features selectable drive modes which are new to Fiesta ST, as well as a flat-bottomed steering wheel, Recaro seats and ST sports suspension as standard. All Fiesta ST models are also equipped with electric, heated door mirrors, Ford’s SYNC3 DAB radio with Apple CarPlay and Android Auto capability, cruise control, and NCAP Pack, which includes Lane-Keeping Alert and speed limiter. The ST-2 level adds climate control, heated Recaro front seats and blue seatbelts, B&O PLAY premium sound system and Ford SYNC3 DAB radio with a larger eight-inch touchscreen as standard. ST-3 level adds 18-inch alloy wheels and red brake calipers, sat-nav, auto wipers and driver assistance features including Traffic Sign Recognition, auto high beam and driver alert. Styling wise there’s no great ‘wow’ factor over top spec new Fiesta versions. The ST tweaks are more subtle with the LED signature front and rear lights, large rear spoiler and a modest rear diffuser. With the lowered suspension and the standard rising waistline side profile it looks only modestly different on the outside. Inside there are the usual ST trim upgrades, well placed controls and a good driving position – but the three-door retains its limited rear access and legroom. What you can’t see however is that the ST versions have a further 14% amount of strengthening to ensure torsional stability and predictable handling through fast corners. 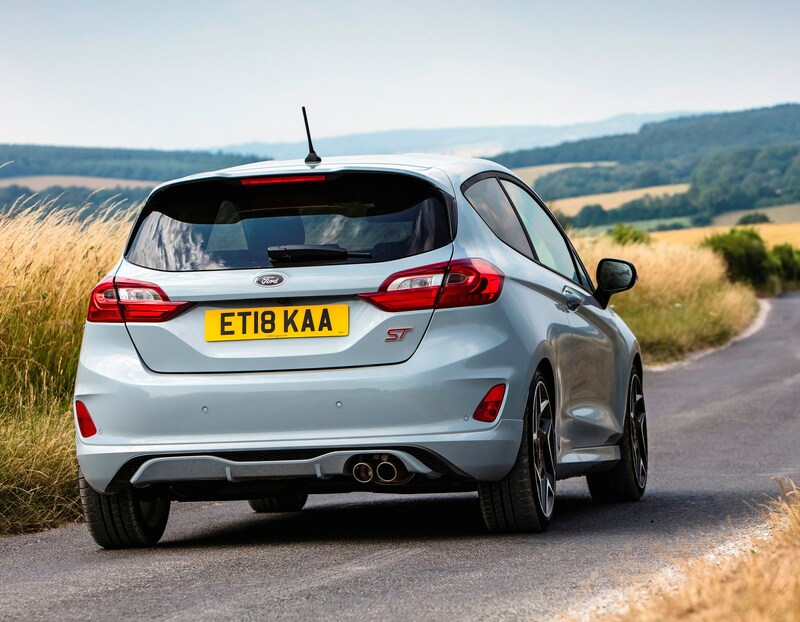 The previous Fiesta ST was a hard-riding car, the new one is still firm but the automatic variable rate lowered suspension has been revised with frequency dependent dampers. It’s very firm when driving hard, reverting to a slightly more compliant ride when not being rushed along. But even then it can still feel tiresome after a long journey on country roads and even on motorways the noise and feel from expansion joints pass into the vehicle. It however remains a very agile car, precise in its tracking through corners, stable under hard acceleration (apart from considerable torque-steer), and with powerful brakes which should stand-up to track-day use. To compliment the performance requirements we need from a hot-hatch there are selectable driving modes, Normal, Sport with sharpened acceleration and more audible sports exhaust soundtrack and Track which disconnects the traction control and softens the intrusion of the Electronic Stability Control system. There is also Launch Control within the Performance Pack option. At the heart of the new Fiesta ST is the 1.5-litre EcoBoost turbo petrol engine which has three cylinders but deactivates one of those during light demands and it’s impossible to tell when it’s using two or three cylinders, the switch is seamless. The engine has a pleasurable exhaust tone, plus a burble on start up and low speeds – and this gets more entertaining as the speed increases but it’s never a ‘drone’ or intrusive, just pleasing. As is the performance with 200 hp and 290 Nm (214 lb.ft) of torque from 1,600 rpm through to 4,000 rpm. The wide powerband, coupled with the six speed gearbox, makes for rewarding driving even if it’s pottering along in traffic or driving at pace on less speed restricted roads. There is no doubt that in conjunction with the firm ride, if driven at a fast pace over a long journey on winding country roads it can be a fairly frantic sort of vehicle. 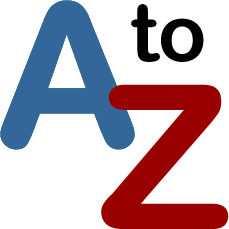 But if you go down the hot-hatch route I guess you can live with and enjoy those characteristics if you are the driver – perhaps not if you are a passenger. The Fiesta ST’s performance and refinement was put into focus for me as it so happened that while I had the car I attend a Volkswagen media event and one of their new models being showcased was the competitor new Polo GTi. 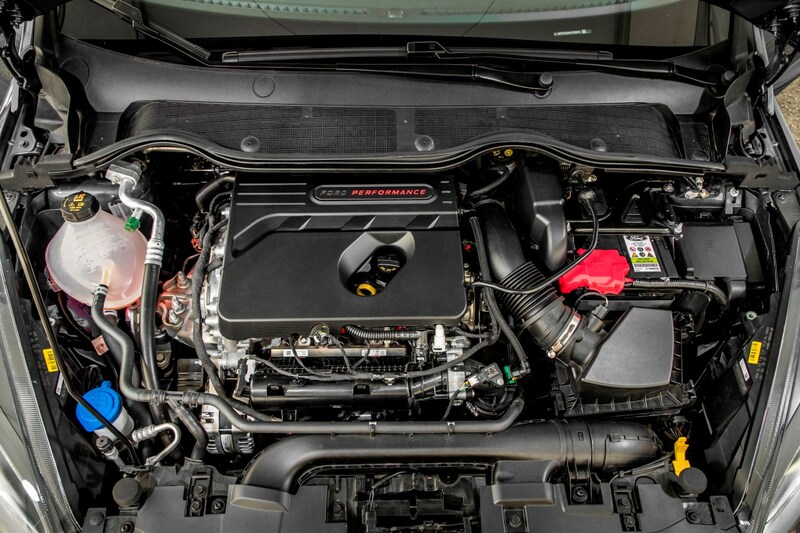 The Polo GTi has a 2.0 litre, four cylinder turbocharged petrol engine with 200 hp and 320 Nm (236 lb.ft) of torque from 1,500 to 4,400 rpm so it has significantly more torque over a wider powerband. The engine is coupled as standard with a six speed DSG twin clutch gearbox, which can be used in full auto mode or you can indulge in a racier operation by using the gear-shift paddles. Top speed is 147 mph and zero to 62 mph takes 6.7 seconds. The WLTP Combined Cycle figure is 47.9 mpg (38.1 mpg on my short test drive). The CO2 figure is 134 g/km so VED is the same but the BiK cost is 1% lower when compared to the Fiesta ST. Insurance for the Polo GTi is Group 26, two groups lower than the Fiesta ST-3 and both hot-hatchbacks are covered by the same three years/60,000 miles warranty period. 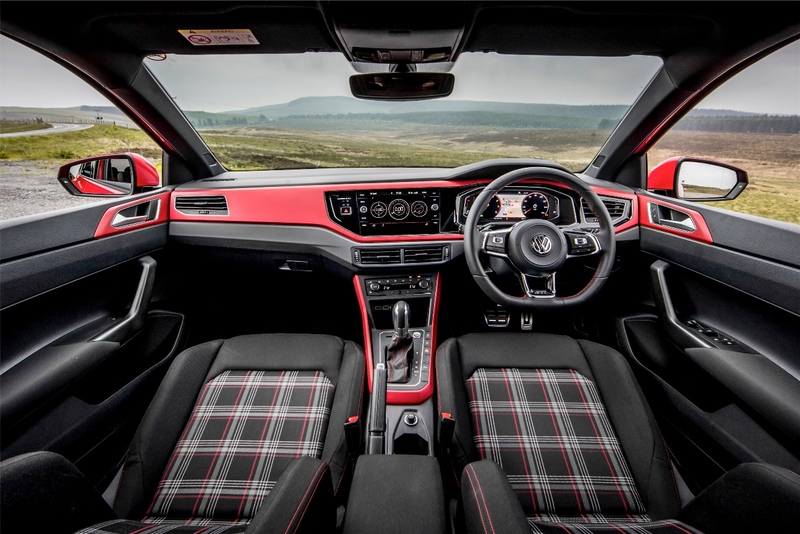 As for the driveability comparison… The Polo GTi produces less torque steer despite providing more torque over a wider power band range so the engine felt stronger, more responsive and smoother with its extra cylinder, and the twin-clutch auto gearbox with paddle shifts was more user-friendly. 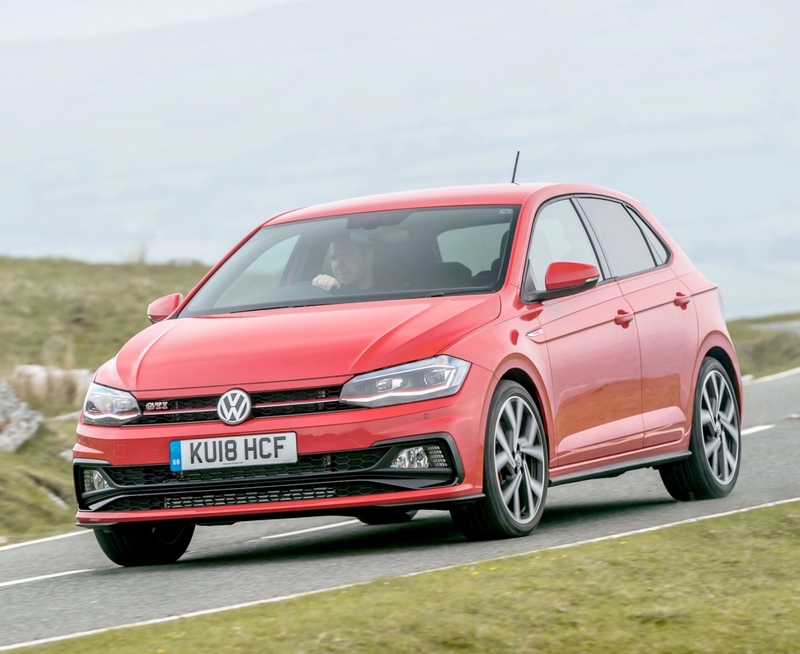 The best bit about the Polo GTi was the far superior ride quality and having four passenger doors made it more practical and user-friendly as well. 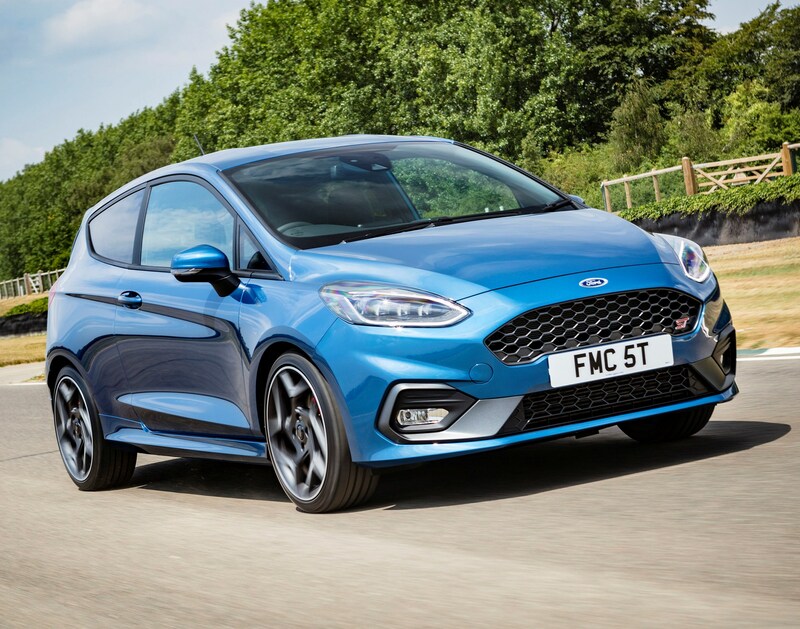 It didn’t feel as agile in the handling department or as hard riding as the Fiesta ST so hard-core enthusiasts will stick with the Ford Fiesta ST. Drivers with families will think more about their passengers than getting their own driving thrills and opt for the VW Polo GTi. 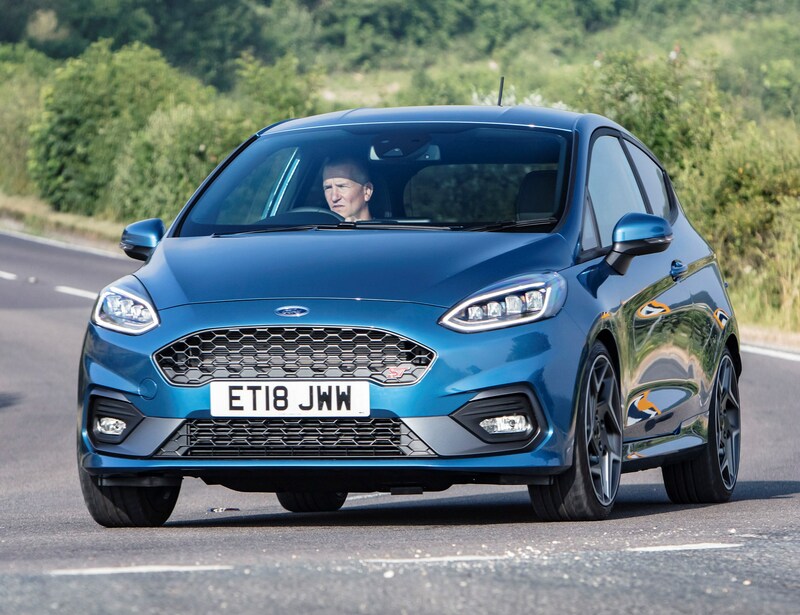 I’m with the latter group but given the Fiesta ST’s numerous hot-hatchback awards to date it’s still the favourite to be the market-sector sales leader. For (Fiesta): Fast, fun and frantic to drive, agile handling, good value for money, high sports specification, award winner. Against (Fiesta): Restricted rear passenger access so the five door version is better value in terms of practicality for little extra cost, very firm ride, huge torque steer under hard acceleration, ungenerous warranty, the Polo GTi engine is smoother and with more torque. New Ford Fiesta ST-3, 1.5T EcoBoost six speed manual, three door hatchback, (best-selling version). 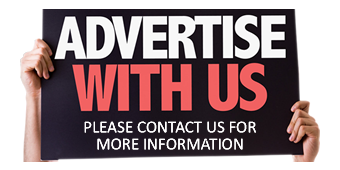 Price: £21,995 (£24,890 as tested). Engine/transmission: 1.5 litre, three cylinder turbocharged petrol, 200 hp, 290 Nm (214 lb.ft) of torque from 1,600 rpm, six speed manual with optional Quaife limited slip differential. Performance: 144 mph, 0–62 mph 6.5 seconds. Fuel consumption: WLTP Combined Cycle 47.1 mpg (43 mpg on test). Emissions and taxation: CO2 136 g/km. VED road tax £205/£140, BiK company car tax 28%. Dimensions/capacities: L 4,068 mm (13.35 ft), W 1,783 mm (5.85 ft), H 1,469 mm (4.82 ft), wheelbase 2,493 mm (8.18 ft), boot/load space 311 to 1,093 litres (10.98 to 38.60 ft), three doors/five seats.